00:10:00 Makes 1 serving, 1 sandwich (200 g). Makes 1 serving, 1 sandwich (200 g). You'll love this simple, yet satisfying, sandwich. 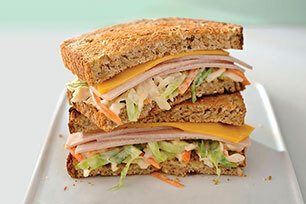 Fill toast slices with turkey, Singles and coleslaw. Prepare as directed, but do not add coleslaw to sandwich. Wrap sandwich; place coleslaw in small covered container. Refrigerate both until ready to pack in insulated lunch bag. Add coleslaw to sandwich just before serving. Prepare as directed using Miracle Whip Calorie-Wise Dressing and Kraft Singles Light Process Cheese Product Slices. Serving Size Makes 1 serving, 1 sandwich (200 g).